We often refer to the far side of the Moon as it’s dark side, but in reality, that side receives just as much light as the rest of the Moon. People usually tend to call the far side of the moon the “dark” side of the Moon because we know little about it as it is seldom seen by people on Earth. This is a common misconception because of how the moon lights up in the sky, people would think that the Moon generates light of its own. Instead, Earth’s Moon reflects light from the Sun towards the Earth, making it seem that the far side of the Moon is dark when in reality that side of the Moon receives just as much light as it rotates around the Earth. An observer can see only a small fraction of the illuminated side when close to the sun. In other words, the smaller the angular distance the less of its illuminated side you see. How is it that barely half of the Moon is visible to the people on Earth? There is one clear explanation as to why we can only see one side of the Moon. This is known as tidal locking. Tidal locking can be defined as a situation when an object’s orbital period matches its rotational period. Since the Moon takes around 28 days to orbit the Earth and around 28 days for a full rotation of the Moon, we will never see the other side of the Moon from Earth but will always see the same side. We generally refer to the Moon by the phases it progresses through. The Moon cycles through the phases of new moon, first quarter, full moon, and third quarter. A cycle is synodic period and takes around 29.52 days to complete. During this time the Moon can either be slowing down or speeding up depending on the force of Earth’s gravity on the Moon. This would cause the Moon to rock a bit, allowing us to see up to 59% of the Moon’s surface from Earth. This is a phenomenon called lunar liberation and it is caused by the Moon being in Earth’s orbit. These give us a picture of why we can see parts of the moon and why we can’t see the other side of the Moon. There have been many missions to see and explore what the far side of the Moon entails. The first one was made by the Luna 3 in 1959; this spacecraft was the third spacecraft to successfully make it to the Moon and the first mission to take photographs of the far side of the Moon. These photographs were very blurry and unidentifiable at first, but after computer enhancement, scientists were able to find mountainous terrain and two dark regions that would be named Mare Moscovrae and Mare Desiderii. These photographs would give a footprint towards the vast differences between the near and far sides of the Moon. The Soviet Union also would send the Luna 10 which was the first spacecraft to orbit around the Moon. This spacecraft was sent in 1966 with the goal of being the first spacecraft to orbit the Moon and gain experience with orbital operations. The data received from the Luna 10 showed a nearly non-existent magnetic field on the Moon which would be pivotal to rotating around the Moons orbit. These missions would unlock new information about the Moon that had never been discovered before. From these missions, Astronomers have found various differences between the near and far side of the Moon. They found that the topography of the far side features more craters and less of the dark spots usually found on the near side of the Moon, called Maria. Maria are defined as large dark basins that are seen on the near side of the Moon. There were a couple of reasons why the far side of the Moon is filled with more craters and less of the dark maria that we see on the near side. The first conclusion that many people came to was that the Earth’s location prevented asteroids and other debris from space from hitting the Moon on the near side while the far side was left exposed to incoming debris. The problem with this hypothesis is that the Moon’s distance from the Earth is larger than the diameter of the Earth so the number of impacts would be very minimal. Instead, what is believed to have happened is that millions of years ago the Moon collided with the Earth. The Earth was significantly hotter than it is now at around 2700 Kelvin. Since the Moon is tidally locked with the Moon, only one side would be exposed to the heat from the Earth. The large dark spots of the Moon are from the lava that would flow into the large basins on the Moon. The near side would stay into liquid state longer than in solid state, so when space debris collides with the Moon, it would not affect the near side as much as it would affect the far side. Since the lava dried up quicker on the near side, it allowed for the far side to grow a thicker crust. These are what the scientists observed when they saw the photos, they have not been able to land on the far side of the Moon so these are just observations based on the photos taken. One of the biggest reasons why astronomers have not landed on the far side of the moon is due to difficulties communicating with Earth. It was virtually impossible to get signals with Earth from the far side of the Moon. This makes landing of the far side very dangerous for astronauts in the case that something goes wrong. While we have not been able to land onto the far side of the Moon, we have had probes and spacecrafts like the Luna 3 mission and the Luna 10 mission take scientific photos of the far side. NASA would also send the Apollo 8 mission to the Moon’s orbit in 1968, this mission would become significant because it is the first time that humans would see the far side of the Moon with their own eyes. This would show that it is possible to see the far side of the Moon. The problem with the mission is that in the 68th hour they had lost signal as they were circling the Moon, this also would cause the spacecraft to slow down by around 2 feet per second. These problems left governments resistant to try to land humans on the far side of the Moon. Things are looking up as China is reportedly making a trip to the far side of the Moon using new technology that will help people get to the Moon. China is planning on sending the Chang’e 4 which will follow the Chang’e 3 mission. In China’s expedition, there will be five main components, the first being a relay satellite which is a low-frequency radio spectrometer provided by the Netherlands as well as an impact flash camera. A lander will also be included in the expedition. The lander will be equipped with a lunar dust analyzer, an electric field analyser to measure the magnitude of electric fields on the moon’s surface. 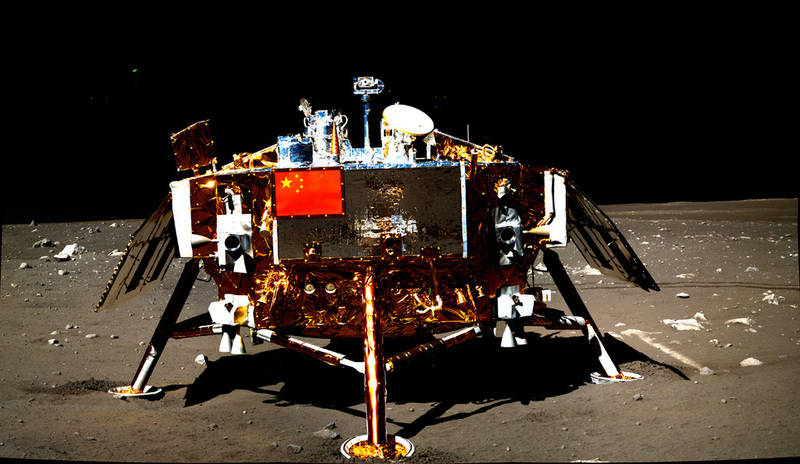 China also plans on placing a rover on the moon which will be equipped with three Yutu instruments. These instruments are a panoramic camera, ground penetrating radar, and an infrared spectrometer. The rover will also carry two public designed instruments chosen by the administration of the expedition. There are 257 entries and the two winners will be picked in September. If China is able to get to the far side of the Moon then it would open up opportunities for humans to learn about the features of the side of the Moon that will never be seen from Earth. The Moon is one of the most noticeable parts of the night sky, with humans being able to point out the Moon with ease as they look into our solar system. This identifiable and invariable part of the night sky becomes a bit less familiar when you talk about the other side of the moon. With the Moon being tidally locked with the Earth, only with the help of Lunar Liberation, we can see up to 59% of the Moon’s surface from Earth. The far side of the Moon, commonly called the “dark side of the Moon” becomes very mysterious as it is very difficult to get to the other side because of communications with Earth. So how do we know about the unique features of the hemisphere of the Moon that has never – and will never – be seen from Earth? It started in 1959 with the Luna 3 spacecraft which took photos of the far side of the Moon’s surface. This trip would be followed by the Luna 10 mission in 1966 which actually orbited around the Moon for the first time in human history. From these trips uncovered many different features that set the far side of the Moon apart from the more commonly seen near side. This would include significantly more craters and less dark spots of Maria. We haven’t been able to land on the far side of the Moon but the China trip scheduled for late 2018 will hopefully open up a new environment for humans to explore and to learn about the endeavours of the far side of the Moon. Ley, Galaxy 24, 126 (1966).